Travelers' expectations for food are high as ever due to the increasing diversity of dietary options and health concerns. In particular, as the number of people who choose to go vegan continues to grow worldwide, several restaurants and cafés make efforts to come up with vegetarian-friendly menus to meet the customer's needs. Not all vegetarians follow an all-vegetable diet. Vegetarians can be categorized into eight different types, ranging from vegans, who abstain from all animal-based products, and flexitarians, who occasionally consume meat. Read on for recommended vegetarian restaurants in Korea and tips on how to make an order according to your dietary preference in case you can't find one. A majority of the restaurants in Korea do not have a set procedure or a manual for those who have dietary concerns. Therefore, travelers who are vegetarians are advised to inform the staff of their diet and provide detailed instructions on what ingredients to exclude upon making an order. Bibimbap: Basic ingredients include meat, egg, gochujang (Korean chili paste), and various vegetables. When ordering, ask to check if any meat is included in the dish. As bibimbap is almost always served with an egg on top, make a request to exclude it from your dish. Stew: Many traditional Korean stews are made from meat or fish broth. Make a request to prepare your order using plain water. Gimbap: Ham and eggs are basic ingredients that go in a gimbap. Other meat ingredient options include tuna and crab stick. Double-check the ingredients before consumption. Soup & porridge: A wide variety of porridges and soup are available in Korea, including those that use meat and seafood. Make a request to exclude meat and seafood upon order. Hamburger: Hamburgers in Korea are not much different from those overseas. Some restaurants serve hamburgers using patties made from grains and vegetables instead of meat. Pasta: Although every restaurant has its menu, most restaurants serve pastas with meat or seafood ingredients. However, since several restaurants have vegetarian pasta menu as well, visitors are advised to ask in advance. Pizza: As the topping options can get surprisingly diverse, special attention is required. Popular vegetarian pizza menus include basil pesto pizza and tortilla pizza. Jjajangmyeon · jjamppong: Jjajangmyeon's basic ingredients include pork along with vegetables like onion and cabbage whereas jjamppong uses seafood. Make a request to exclude any meat or seafood and prepare food with vegetables only instead. Dim sum: Dim sum is usually filled with either seafood or meat. Ask the staff in advance to avoid dim sum with seafood or meat. Mapa dubu bap (Mapo tofu with rice): Since pork is the most basic ingredient this menu, inform the staff to exclude meat upon order. Curry: Special attention to the ingredients are needed as a variety of curry menus are available. Even vegetable curry can include either cheese or cream. Sushi: As the main ingredient for sushi is seafood, inform the staff of your vegetarian diet and ask for recommendations. TIP) Most Korean restaurants make food preparations according to their recipe unless a special request is made. Always inform the staff that you are a vegetarian ahead of time. Sometimes, a language barrier may get in the way of communication so it's also a good idea to prepare a written information in advance, such as "I am a vegetarian (저는 채식주의자입니다)" or "I cannot eat any meat, eggs, and seafood (육류, 달걀, 해산물 등을 먹지 못합니다)." You can also use one of the many translation or interpretation apps available on mobile. Plant serves meals and desserts made without using any eggs, milk, and butter. Plant is not only a popular restaurant among vegetarians, but also recommended among international tourists. Take note that Plant does not have menus for those who are strictly fruitarian. Directions: Itaewon Station (Seoul Subway Line 6), Exit 4. Walk approx. 5 min. Around Green is the hottest vegan restaurant in Mangwon-dong. The restaurant menus fit for vegetarians such as sandwich, tofu topping rice, and curry. The most popular menu is the black bean steak, made from substitute meat using organic black beans, topped with vegan demi-glace sauce. Directions: Mangwon Station (Seoul Subway Line6), Exit 2. Walk for approx. 15 min. Slunch is a vegetarian friendly café and a restaurant. Their menu provides ingredient information along with vegetarian classification, allowing any vegetarian to choose the menu conveniently according to their dietary preference. However, Slunch do not have any menu items fit for those who are fruitarian diet. Directions: Sangsu Station (Seoul Subway Line 6), Exit 3. Walk for approx. 10 min. Owned by vegetable grocery store Veggie Food, Osegyehyang has been serving vegetarian food for over 10 years at Insa-dong. The greatest draw of this restaurant is the diverse variety of menus. Oseggyehyang only prepares food using vegetables and therefore do not have any menu items for fruitarians. Directions: Anguk Station (Seoul Subway Line 3), Exit 6. Walk for approx. 5 min. Loving Hut Café is part of the international vegetarian chain restaurant Loving Hut. From meals to desserts, the café offers a wide variety of menu that is 100% vegan. A total of 15 cafés are spread throughout Korea, namely in Seoul, Gyeonggi-do, Daejeon, and Jeonju. 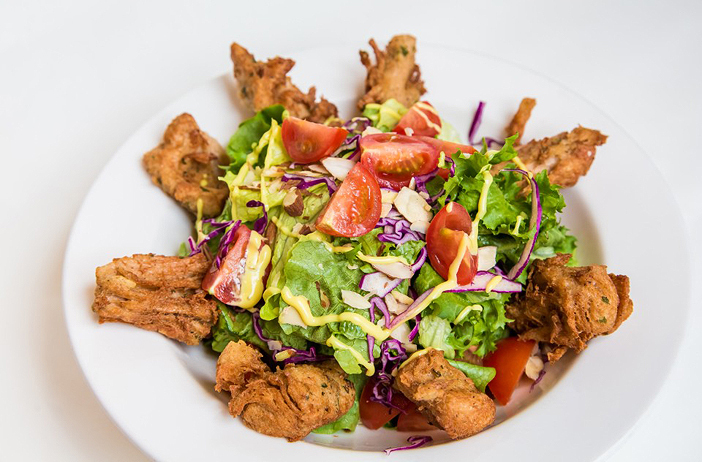 More information on branch locations can be found at Loving Hut's official website. Directions: Yangje Station (Seoul Subway Line 3, Shinbundang Line), Exit 5. Take Bus Gangnam 02 and get off at Kookmin Bank Green Park Bus Stop. Walk for approx. 5 min. This page was last updated in January 29, 2019, and therefore information may differ from what is presented here. We advise you to check details from the official websites before visiting.